Pramod Sharma worked at Google in Sunnyvale, California and noticed when he dropped off his daughter at the company’s daycare facility, there were no tech products allowed. Sharma and his co-founder Jerome Scholler created Osmo in 2013 to create a positive and educational screen time experience for kids. Osmo’s magic lies in its proprietary hardware piece that snaps onto a tablet, using mirrors to connect the movements a child makes on a physical game board with animations on the screen. Osmo has raised over $38 million, has more than 60 employees, and can be found in a half-million households worldwide. Circa 2012, Pramod Sharma was working on a Google project to scan physical books and put them on the internet. Like many at Google, Sharma would drop off his daughter each morning at the company’s on-campus daycare facilities. Over time, he recognized something both ironic and worrisome. There were no tech products in the room. „They were very proud of their wooden blocks from Germany,“ Sharma told Business Insider in a recent interview. However, he knew how much his daughter loved any screen that was put in front of her, and thought there had to be room for a positive piece of technology in her life. With his experience combining the analog and digital worlds for Google Books, ideas started to bubble up. And so, in 2013, Osmo was born— with the help of his co-founder and fellow Googler, Jerome Scholler. 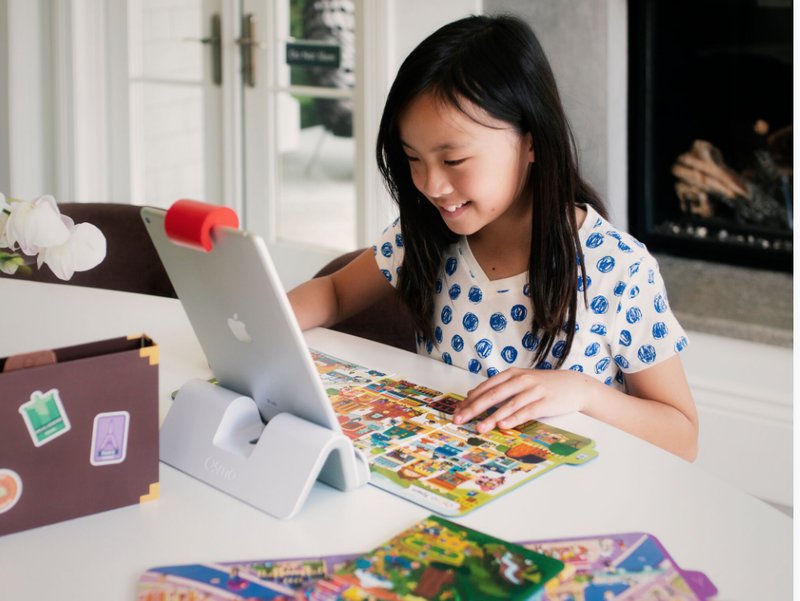 The big idea: A proprietary hardware accessory that snaps onto any iPad, using mirrors to connect the movements a child makes on a physical game board with animations on the tablet’s screen. Osmo recently added certain games to be compatible with Android and Amazon Fire tablets as well. One game called „Monsters“ prompts kids to draw objects (like a magic wand), and once their drawing is complete, a replica appears on the screen being used by the animated monster. Another, called „Coding Awbie“ — which the company says is „easiest way to introduce coding to your child“ — allows kids to create commands for their on-screen character by snapping different combinations of blocks together. Sharma says he understands the hesitation of parents, especially parents in Silicon Valley, to expose their children to too much screen time. But Sharma argues that not all screen time is equal. He tells us there’s a difference between passive screen time (where a child is merely sitting in front of a screen, watching) and active screen time (where a child is called to engage). Omso prides itself on creating active screen time for children. In the future, Osmo wants to allow for a more personalized experience for children, recommending games for them based on areas of learning where they could use improvements. „My daughter is in 4th grade, and I actually don’t know what her weak points are,“ Sharma tells us. He imagines most parents feel the same way and believes Osmo is the perfect platform to help. As a first-time CEO, Sharma tells us that the hardest and most exciting part of his job thus far has been learning how to be a leader. Sharma says his favorite moment thus far leading Osmo came with the launch of its latest game. As for getting Osmo into Google’s daycare center, Sharma says that may be possible now with the release of „Detective Agency“ — the company’s first game compatible with Android.